Napoleon’s younger brother Louis Bonaparte failed to become the great soldier Napoleon had trained him up to be, or even the pliable puppet Napoleon would have settled for. Instead, he became an irritable hypochondriac and literary dilettante who fathered another emperor. Charles and Letizia Bonaparte had eight children (see Napoleon’s family tree), of which Louis Bonaparte was the fifth. Born on September 2, 1778 in Ajaccio, Louis was nine years younger than Napoleon. He was still a baby when the latter left Corsica to start school in France. On his visits home, Napoleon developed a fondness for Louis, so much so that he decided to take charge of the boy’s education. Twelve-year-old Louis was less enthusiastic about the project. Napoleon made him work hard, and Louis missed Corsica. He wrote to Joseph suggesting that he might come home. Napoleon obtained a commission for Louis as a lieutenant in the 4th Artillery Regiment. 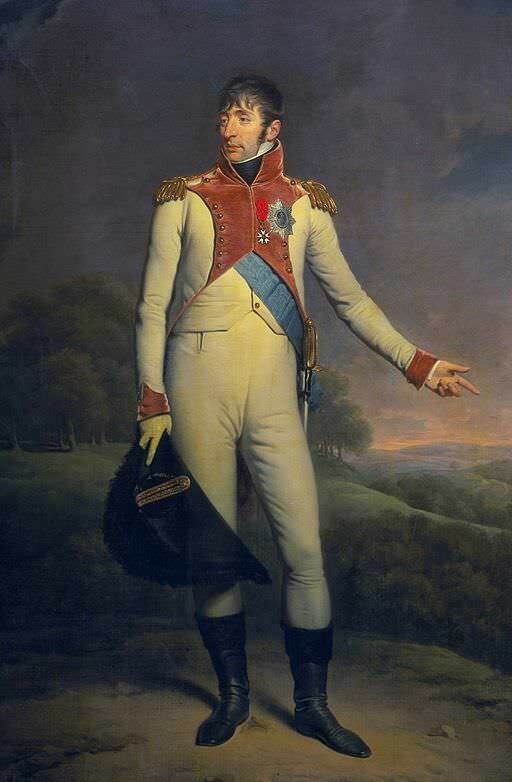 Louis was assigned to Napoleon’s staff as his aide-de-camp. Louis bore himself bravely in the Italian campaign of 1796-97 and was promoted to the rank of captain. By 1796, however, Louis was starting to suffer from the bouts of illness (real and imagined) and depression that would plague him for the rest of his life. He did not want to go on the Egyptian campaign, but Napoleon told him he must forget a love affair (which Napoleon ended by marrying the girl off to someone else), stop talking about devoting himself to poetry and literature, and be a soldier. Louis Bonaparte served as Napoleon’s aide-de-camp in Egypt, leaving early when Napoleon sent him back to France to deliver messages. He took no part in Napoleon’s November 1799 coup d’état in France, but shared in its benefits, receiving a promotion to Chef de Brigade of the 5th Dragoons. This was no benefit to the regiment: Louis declared he was ill, took the waters at Aix, wrote poems in Paris, and avoided the campaign against the Austrians. Napoleon and his wife Josephine determined that Louis should marry Josephine’s daughter, Hortense de Beauharnais. Neither Louis nor Hortense felt any attraction for each other, but they could not resist the pressure to wed. They were married on January 4, 1802 and their first son, Napoleon-Charles, was born on October 10 of that year. Louis – who had by now joined his regiment as a preferable alternative to being with Hortense – was promoted to brigadier general the following April. A second son, Napoleon-Louis, was born on October 11, 1804. Hortense disliked living in Holland. Making matters worse, four-year-old Napoleon-Charles died on May 5, 1807. Hortense became ill with grief and returned to France. On April 20, 1808, she gave birth to another son, Louis-Napoleon. Louis – who was intensely jealous of his wife’s friends – did not believe the child was his. Napoleon bled Holland to finance his military campaigns and stripped it of troops for his planned invasion of Russia. When England attempted to capture Antwerp and Flushing in the Walcheren Campaign of 1809, Louis was in no position to defend his kingdom. Napoleon choked Dutch trade in an attempt to prevent British goods from entering the continent. Struggling hopelessly to preserve a show of independence, Louis drifted into a position of open hostility against Napoleon. Louis attempted to negotiate a compromise that would leave him the Dutch crown, but Napoleon was already moving French troops into Holland. Louis did not want to preside over the ruin of the country. On July 1, 1810, he abdicated in favour of five-year-old Napoleon-Louis, who in theory reigned for eight days as Louis II before Napoleon annexed Holland to France. Louis Bonaparte fled to the baths of Töplitz in Bohemia and wrote to Francis I asking for permission to reside in the Austrian empire. Louis assumed from his French property the title of Count of St. Leu, the name by which he henceforth wished to be known. Though Napoleon insisted that he return to France, Louis settled at Graz, the capital of Styria, south of Vienna. There he became something of a hermit, seeing few people except his doctors, whom he changed from time to time, and with whom he quarreled. In 1812, as Napoleon was brought to ruin in Russia, Louis printed for circulation among his friends a volume of original poems and translations from Horace, as well as a long-winded romance entitled Marie ou les peines de l’amour (Maria, or the Torments of Love). The heroine was a Dutch girl. His health continued to be poor. For most of that year he suffered from a partial paralysis of his right hand. To write he wore a glove to which a pen was attached. His mother urged him to make peace with Napoleon and return to France, but Louis had no interest in being near his brother or his wife. Though Napoleon would not permit them to divorce, by that time Hortense and Louis had definitely split, and she had taken a lover, the Count de Flahaut (generally thought to be Talleyrand’s illegitimate son), with whom she had illegitimate child, the future Duke of Morny. Louis clung to the hope of restoring his fallen throne and insisted he was still king, whose rights both Napoleon and the coalition against France ought to recognize. When it became clear Austria was going to join the coalition against Napoleon, Louis left Graz for Switzerland. When the allies approached Switzerland, Louis went to France, arriving in Paris on January 1, 1814. When Napoleon left to fight the invaders, Louis bid him goodbye and wished him good fortune in the coming campaign. Napoleon spoke to him kindly and told him he could help Joseph in Paris. After Napoleon’s abdication, Louis Bonaparte went to Italy. Louis asked Hortense – who remained in Paris with their sons – to send Napoleon-Louis to him, but she refused. Louis began an action in the Paris courts to compel her to give him custody of the boy. In March 1815, the tribunal ruled in his favour, but Hortense took no notice. In 1817, she moved to the estate of Arenenberg in Switzerland. Louis did eventually obtain custody of Napoleon-Louis and devoted much time and thought to his education. 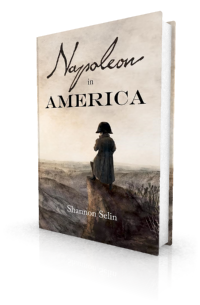 In 1821 – the year in which Napoleon in America finds him grumbling up the stairs to his mother’s salon – Louis Bonaparte was living in Rome, where his mother, his sister Pauline and his Uncle Joseph Fesch also lived. Louis had the Palazzo Mancini and a villa at Albano. His brother Lucien lived north of Rome at Canino. In 1826 Louis left Rome for Florence, where he spent the rest of his life as an invalid. He and Joseph arranged the marriage of Napoleon-Louis to Joseph’s daughter Charlotte. Napoleon-Louis and Louis-Napoleon became involved in plots to drive the Austrians out of Italy and establish a republican government in Rome. On March 17, 1831, while the brothers were fleeing Italy due to a crackdown on revolutionary activity, Napoleon-Louis died, age 26. The official cause was listed as measles, but he may have suffered a bullet wound at Forli. In 1836 Louis-Napoleon tried to orchestrate a coup against King Louis Philippe of France, but was captured in his initial uprising at Strasbourg. He took refuge in Switzerland, then travelled to London, Brazil and New York before hurrying back to Switzerland to be with Hortense when she died on October 5, 1837. Louis-Napoleon attempted a second coup at Boulogne in 1840. This time he was imprisoned in the fortress of Ham with Charles de Montholon. Louis Bonaparte had nothing to do with his son’s insurrections. He spent his final, crippled years on a couch or in a wheelchair in the garden of his villa at Florence, or at Leghorn, where he was taken for the sea air. In 1840 he was allowed to visit the Netherlands, where he travelled incognito. Some of the Dutch found out he was their former king, which led to a cheering crowd under his hotel window. Louis was quite moved. Louis-Napoleon’s imprisonment came as a severe blow to his father. Louis Bonaparte sent letters to France asking for an amnesty for his son, or at least for his temporary release on parole so he could see him. In 1846 a pathetic letter from Louis reporting a marked increase in his infirmities spurred Louis-Napoleon to devise a means of escape from Ham. In May 1846, he slipped out wearing a disguise and fled to London, but found it impossible to obtain a passport for Florence. Louis Bonaparte died on July 25, 1846, age 68, without seeing his son. He was buried at Saint-Leu-la-Forêt, Île-de-France. Louis-Napoleon became the heir to the Bonaparte dynasty and later ruled France as Napoleon III. April 4, 1791. John Eldred Howard, ed., Letters and Documents of Napoleon, Vol. 1 (New York, 1961), pp. 25-26. Sept. 6, 1795. Ibid., p. 60. A. Hilliard Atteridge, Napoleon’s Brothers (London, 1909), p. 72. Jan. 2, 1807. Ibid., p. 178. Jan. 17, 1813. Ibid., p. 314. Louis Bonaparte, Historical Documents and Reflections on the Government of Holland, Vol. I (London, 1820), pp. 8-9. D. A. Bingham, ed., A Selection from the Letters and Despatches of the First Napoleon, Vol. 3 (London, 1884), p. 427. Thank you, Robert. I’m glad you enjoyed the post. Yes, there are living descendants of Napoleon’s siblings, as well as descendants of Napoleon’s illegitimate son, Alexandre Colonna-Walewski. This Wikipedia article on the House of Bonaparte provides details: http://en.wikipedia.org/wiki/House_of_Bonaparte. Wonderful clarification of what was to a murky view of this part of the Napoleonic legacy ! Thank you for the good history. 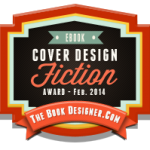 I really enjoy reading it. Thanks, Mungasa. I’m glad you’re enjoying the blog. I enjoyed your article. I learned about Louis Bonaparte nearly 8 years ago and he’s been a great influence to my own fiction projects ever since. So sad he’s hardly remembered in the Netherlands. Thanks, Pim. I’m glad you liked the article. It is too bad he’s not better known. Hello Shannon, I’ve been rummaging around on your website, thank you for the stories and insights. Just curious: did you ever run across a picture or name of his palazzo in Florence and moreover; have you seen anywhere a picture of his second wife Julia Livia di Strozzi, apparently the most beautiful woman in Italy. Thanks, Mathieu. Thanks, Mathieu. Louis Bonaparte lived in the Palazzo Gianfigliazzi at Lungarno Corsini No. 4 in Florence from approximately 1826 until his death. There are some images of the building here: https://commons.wikimedia.org/wiki/Category:Palazzi_Gianfigliazzi. Thank you for bringing up Julia Livia di Strozzi, the 16-year old girl Louis reportedly married in 1838, when he was 60 years old. She was said to be a beautiful blonde, but I haven’t seen any pictures of her. Her real name was probably Mathilde, and it’s not clear whether she and Louis actually married. She died in 1839, at the age of 17. See: https://fr.wikipedia.org/wiki/Discussion:Louis_Bonaparte. In troublous times, moderate men are sure to suffer; seeking to avoid excess, they are necessarily exposed to the attacks of all parties; and it may almost be said that there are periods when our country is nothing more than a name, the ties of blood are only prejudices, and duties the portion of dupes!